White Paper Published By: Coupa Software Inc.
High-growth companies to large enterprises are increasingly evaluating and implementing Procure-to-Pay platforms that enable employees to buy what they need quickly, cost-effectively, and safely. Whether you’re looking to make your first eProcurement purchase or expanding technology usage across the full range of spend management process, the Forrester Wave: eProcurement Report identifies leading eProcurement solutions. 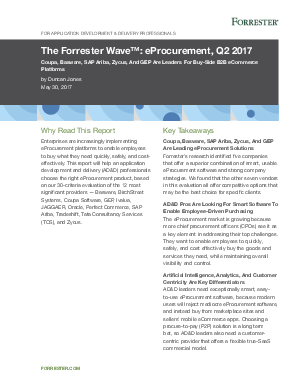 That’s why we’re excited to report that Coupa is named a leader in the Forrester Wave: eProcurement Report—again.